When editing an event you will see a ‘Registration’ tab. On this page you can set-up and enable registration. You can add multiple tickets to your event. Each ticket can have its own price point (make it zero for a free event), registration limit. If your accepting registrations for a repeating event, you can choose to charge for each occurrence of that event as well as the whole event. You can also set an overall ticket limit for the entire event. By clicking the little cog icon to access more settings like a description and availability dates. The description of the ticket types is useful to help communicate what the different ticket types are for to people registering, and if the different ticket types entitle them to different benefits at the event, such as “No meals included with this ticket” etc. You can set up availability dates as well with the tickets. Doing this means that the tickets can only be purchased during the specified timeframe, which is great for Early Bird tickets etc. 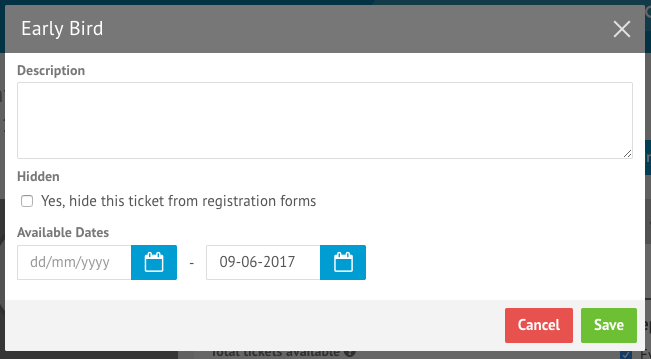 In this example, the ticket will be available until the 9th of June 2017. After this the “Early Bird” ticket type will no longer be available. If no there are no tickets currently available, the form will not accept registrations. When someone fills in your registration form, each ticket is linked to a person. As an example, if an individual were to choose 2 ‘Adult’ tickets and 2 ‘Children’ tickets, the form will automatically ask to provide information for those 2 adults and 2 children. You can choose what information you’d like to collect for each adult and child when editing the form layout. A discount code can deduct a percentage or value. You can also add limits to how many times it can be used and when clicking the little cog icon you can adjust the description, availability dates and what tickets the code can be used on. Discounts can be percentage based, or amount based. The discount is then taken off the total amount of the invoice, which can mean they may act in strange ways. Only one discount can be used a time. 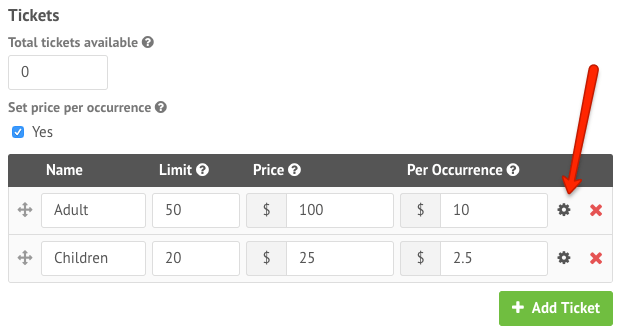 A percentage based discount takes the designated percent off the total amount of the invoice, for the ticket types that the discount is used for. 3 “Early Bird” tickets are being purchased at $25 each. This brings the total to $75. A 10% discount is applied. This brings the total down to $67.50. 3 “Early Bird” tickets are being purchased at $25 each, and 2 “VIP” tickets at $150 each. A 10% discount is applied, which is set to only apply to the Early bird tickets, not the VIP tickets. In the same way as above, Amount based tickets only apply to the total amount of the tickets, not per ticket. Unlike percentage based discounts though, this doesn’t scale when someone buys multiple tickets. Amount Based discounts also can’t be used to drop the total view under $0.00. 3 Early Bird tickets are purchased at $25 each. A discount code is used that entitles the user to $100 off. This will bring their total to $0. As it’s a negative amount, the “Total” for the invoice is increased to be $0. You can adjust additional settings such as currency, tax, payment methods and even enable part payments for an individual event allowing you to cater for different types of events in different cities, states or even countries. Once event registration is set-up and enabled, you can begin accepting registrations but creating an event registration form.